And we strongly believe in Mr. Wild ́s words, that’s why the mark that you leave in a person’s eye last forever. For this reason, we have put together five common tips which are continuously ignored by men that do not know a fashion’s basic rules. These rules can help them navigate in society, business, family, and leisure. Ignoring these rules represents a complete disregard for the power of first impressions. Just remember, the devils in the details. This tip includes all accessories but we thought we’d start with the biggest offenders. There are many ways to mix and match accessories in relation to color, but there is a main rule to be followed. WEAR THE SAME COLOR ACCESSORY COMBINATIONS. While choosing black shoes for todays outfit, wear a black belt accordingly. End of discussion. 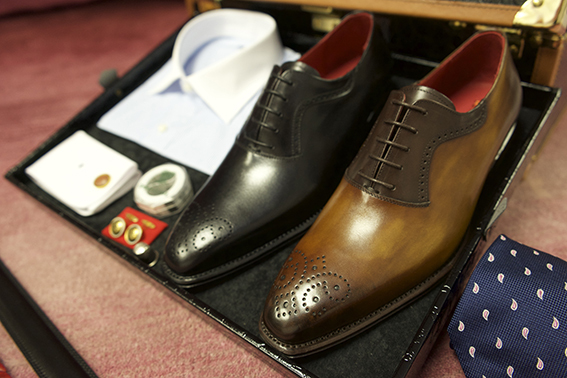 The same happens while choosing brown shoes, go easy and wear a belt with the same color, it could be a different shade, but it should be the same color. Don’t think you invented a new look. It’s been done, it looks bad. This one seems obvious but there are still offenders. When wearing shoes your socks should never be white sport socks. End of story. WEARING THE SAME COLOR SOCKS AS THE SHOES, As long as most of the sock is the same color as the shoe, you’re in the clear. It is an easy rule of thumb to help you not make any embarrassing mistakes. We know it for most men, shopping isn’t the most exciting experience in our lives, and if we can avoid it, we will. FIND YOUR SIZE AND FIT (not just the first suit off the rack) Wear a variety of styles and brands and see who conforms to your unique body shape. A suit is an investment and you’ll be spending some of the most important interactions of your life wearing it. If you stand in front of a mirror it should be obvious whether a suit supports your image. Get the advice of the instore attendee or stylist, bring your wife, your friend, or someone personal that you trust. For those who wants to see the very best out of their shape, procure a custom-made suit. The only way the suit will perfectly fit you is if it’s made from scratch for your silhouette. DO NOT WEAR BIG LOGO CLOTHES, Buying into logos only represents your complete lack of style. Wearing a logo is like shouting your unoriginality. Remember always in fashion less is often more. The pocket shirt is a classic insider secret for identifying someone who doesn’t know how to dress. To avoid any mistakes WEAR POCKETLESS SHIRTS ALWAYS. The only exception is during leisure time. At those times, a casual linen shirts or “guayaberas” are allowed. There are a lot more intricacies to menswear than most realize. These are a few of the raw basics. Fashion is a tricky subject that widens as you pull the thread. In the coming months, the writers at Jose Acosta will be publishing a series of blogs to help guide you through the complexities of suit wear. Stick around and check it out! This entry was posted in Style, Style tips, Trends. Bookmark the permalink.